The full story is available at http://rsftripreporter.net/xComcast/R-n-T_article.pdf. Prior to this point, I was somewhat Parked in the Sixties, musically speaking, listening to such groups as the Jefferson Airplane, the Animals, the Zombies, Simon & Garfunkle, Country Joe and the Fish, and The Ventures (of course!). Naturally, after making the connection to "Red Barchetta," I immediately became a Rush fan and began catching up with the band's considerable catalog. Well, now we have to flash forward again, this time to 2006. At the DC International Motorcycle Show, my friend Dave told me about a book by Neil Peart, titled Ghost Rider. In the book, Neil described how he tried to find himself again following the tragic deaths of, first, his college-age daughter and, subsequently, his wife. Emotionally, he was completely devastated and just empty--beyond any level that most of us can imagine. Eventually, all he could do was to keep moving, so he got on his R1100GS and started riding. Many months and well over 100,000 miles later, he began finding the will to return to life and to stop being the "ghost rider." My friend Dave thought the book was outstanding and recommended it to me highly. Last Fall, I bought a copy, and I soon found myself in thorough agreement with Dave's assessment. It was a moving and eloquent story, and I couldn't put it down. In December, I wrote a letter to Neil Peart saying how much I liked Ghost Rider and explaining that I was the Richard S. Foster from "A Nice Morning Drive" all those years ago. I wasn't especially optimistic that Neil would even get the letter, since he and the other band members receive thousands every year, but in early January I received a package containing a copy of his newest book, RoadShow. It had a very nice inscription on the title page, and there was also a long letter in the package. 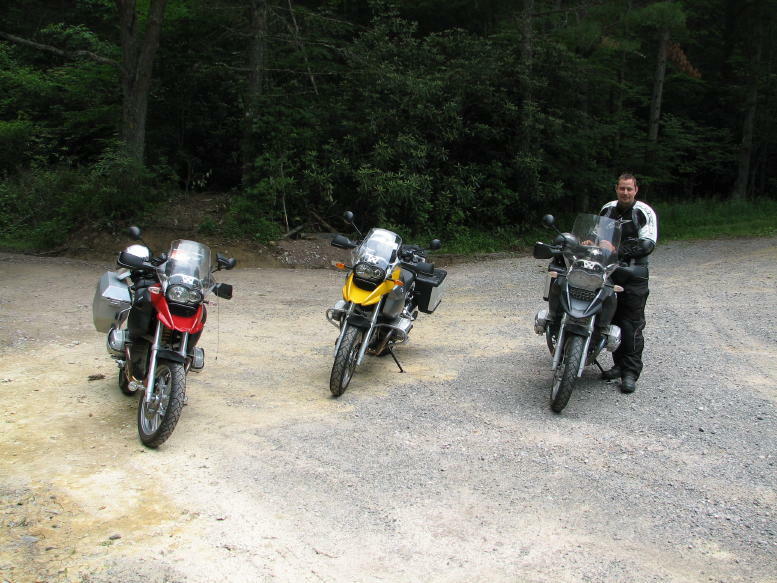 Thus began a long series of e-mails that eventually led to planning a GS ride together while Neil was on the East Coast for the 2007 "Snakes and Arrows" World Tour. We arranged that I would meet him on Sunday, June 24, near Tom's Brook, VA, following the band's performance at the Nissan Pavilion the night before. From there, we would follow Neil's route into and through West Virginia, and then head north toward their next show on Monday night outside of Pittsburgh. I dutifully arrived and found his bus at 8:00 am after a 115-mile ride from Catonsville. To avoid the tedium of life on the road for a several-month tour, Neil rides his BMW from one venue to the next. For use at the concert and to exit the area after the show, he has this tour bus. The trailer holds his new red 2007 R1200GS (already with 7,500 miles on the clock), Michael's similar (but blue) '07 GS, Neil's "emergency backup" older red R1200GS, with close to 100,000 miles, and bus-driver Dave's Harley Davidson. Neil led the way, with me next, and Michael bringing up the rear, "making sure Rick doesn't get left behind and totally lost." We stopped every so often to stretch our legs and "burn a square," as Kitty likes to say. Neil admires my Zumo and tries to avoid looking at my "damnable BMW side cases" while he and Michael wonder where I've wandered off to this time. After lunch near the Snowshoe ski resort, in a restaurant that was closing forever the next day (what did we say?? ), we headed off to discover what a West Virginia dirt road was like. Very soon, we were scrambling up steep, rocky, gravelly climbs and tiptoeing down the inevitable declines. At least, I was tiptoeing; Neil and Michael managed to disappear in a cloud of dust ahead of me, while I puttered along at "only" 30 mph on the straight, level sections. On the more difficult ones (and let me tell you, there were lots), I learned that the Zumo speedometer would read in tenths of mph when you were going less than 10 mph (e.g., 5.5). Fortunately, after every tricky section, I would find Michael waiting for me to ensure that I was okay and still on course, just like Neil waited for him. I felt totally out of control "only" three times, all while descending steep gradients with lots of ruts, rocks, and gravel, but I managed to stay upright throughout. On one of the few sections level enough to actually park, we stopped for a moment to share the solitude of a WV mountain. Speaking of Michael, here he is consulting Doofus, who is no doubt telling him, "You're in the middle of @#$%&*! Nowhere in West Virginia, you idiot!" Neil putts by peacefully so I can get a picture--and then disappears in yet another Cloud o' Dust. After approximately 280 miles (not counting my 115-mile ride to meet up with the bus), we arrived in Buckhannon, WV and found a suitable motel for the night. Neil poured The Macallan for all of us. I'd read about this amazing "tipple" in RoadShow: It was first produced in 1824, it's considered the world's best scotch whiskey, and this particular batch was 18 years old. It was fine! After washing up, we hiked over to a steakhouse for dinner. Michael recommended a shortcut, which eventually involved climbing a near-vertical 30-foot cliff above a stream conduit. And this guy is in charge of Neil's safety?? Well, we all made it to the top and had a good dinner, presented by a cute waitress who did well putting up with us. During the dinner, thinking back on our pace and Assorted Passing Maneuvers, I said to Neil and Michael, "You guys are bad influences!" They grinned broadly and responded, "Damn right!" and "You bet, and we're proud of it!" The next morning, Neil and I ate breakfast at the motel, while Michael got a little extra rest. On our way back, we banged on his door and yelled, "It's time to get up, Wendy!" The two of them have an ongoing exchange of jibes, insults, and witty repartee that has to be heard to be believed. Great fun, although it's a wonder they don't attack each other sometimes! We rode back to Buckhannon and picked up Neil's route. However, the next WV dirt road that we turned onto ended abruptly with a closed (and locked) gate, so we had to backtrack. The same story, more or less, played out with the next 4 or 5 dirt roads that we tried. Although the GPS's showed the trails continuing, they ended at people's houses, farms, cemeteries, you name it. Eventually, however, we found a proper dirt road, and Neil and Michael proceeded to do their best motocross impressions while I skittered along behind. At one point, I was so far back that I decided I could afford to stop for another photo. Note the dog at the far right telling me to move on; this was a "working" farm barn. A short hike brought me to the Two Locks area on the C & O Canal. A very pretty sight, as it turned out. And, on my way back to civilization, I passed this barn/manger, complete with Big Momma Llama, baby llamas, big and little goats, and big hens of some kind. All of them seemed to get along just fine. To quote the Ghostbusters, "Dogs and cats sleeping together--what is the world coming to??" Normally, this is where the report would end, having completed 688 miles of riding in two days. But remember the part about me flying to Cape Cod? The primary purpose was to join my wife in Falmouth for a short vacation. But as it happened, Rush was playing at the Tweeter Center outside of Boston, only 60 miles away from Falmouth, on Wednesday night. Needless to say, a short road trip was in order. So, after having left Neil and Michael in West Virginia on Monday afternoon, I drove to Mansfield, Massachusetts Wednesday evening and met up with them all over again. I was joined by the intrepid Buzz, my college roommate and best friend--and, for the record, the hero of the story "A Nice Morning Drive." He was vacationing with us in Cape Cod, along with his wife and their 9-year-old grandson. Neil kindly provided tickets to the concert for Buzz and me, plus backstage passes, t-shirts, CDs, tour booklets, hats, etc., etc., etc.--and dinner! We chatted some more with him in his practice room, and then we bumped into Alex, with whom we traded Important Lead Guitarist Secret Tips. Were we happy campers or what?? Here I am, together with more than 10,000 other attendees, just before the show began. These guys are just as popular as ever and have been filling every arena on the tour. It was brutally hot, we were all jammed in together, there was zero breeze--and we were all treated to an incredible rock and roll performance. I knew from listening to their records that all three of them were exceptionally talented. It wasn't until I saw them in person, however, that I realized the full extent of their abilities. Alex would literally fling sweat off his hands and then launch into a breathtaking guitar solo. Geddy would switch seamlessly back and forth between the bass and keyboard, singing all the while in his trademark voice. And The World's Greatest Drummer drummed his heart out in the 90-degree weather, with innovative styles, compelling and addictive rhythms, and feats that must be seen and heard to be believed. The crowd's favorite song was Neil's approximately 15-minute drum solo, featuring a revolving drum set. (He switched 180 degrees twice during the solo, to play the drums behind him.) It was mind-bending enough before he drummed in 3/4 time with his feet and 7/8 time with his hands... By any reasonable standard, this technique should be impossible. When I asked him whether the pattern coincided every 21 beats or every 32, he said it took him a very long time to learn to drum in this way, and he didn't dare think about how it actually worked! Beyond the substantial energy of the band, their virtuosity with their instruments, and the exceptional musical innovation and fluidity, the lyrics to the songs must be mentioned. They are written by Neil and set to music by Geddy and Alex--and, in my view, they are a major factor in what sets Rush apart from so many other top bands. Despite their brevity, the words convey complex thoughts and moods and do so in ways that can in turn be moving, mysterious, or incisive. It's pure poetry. The audience gave the band innumerable standing ovations (in part because no one ever sat down throughout the more than 3-hour concert), but eventually the encores were finished and we were all left with "the amplifiers ringing in our ears." We filed out in awe and drove back to a suddenly normal-seeming time in Cape Cod. Well, that's it. I had a blast from start to finish. Thanks, Neil and Michael, for a rousing ride and a fabulous concert. I'll remember the whole adventure forever--or, given my age, as long as I can! PPS: Our route through WV is available as a MapSource file, if anyone would like the particulars. PPPS: Neil Peart's personal web site is at http://www.neilpeart.net/index2.html. It's well worth a visit. How many other world-famous rock and roll drummers can boast "Bubba's Book Club"?? Last edited by Rick F. on Mon Nov 02, 2015 2:37 pm, edited 5 times in total. WOW - a pretty amazing tale on so many levels! Wonderful Rick. Certainly some memories to treasure for a long time to come. Your next ride story will have some very large shoes to fill if it hopes to compete with this one but I am sure you are up to the challenge. Ted wrote: WOW - a pretty amazing tale on so many levels! HOLY CRAP, RICK!!!! THAT'S AWESOME!!! Yeah, but is he joing the club?? Great great memory made there. Sooooo jealous! Freakin' amazing! Great story!!! Major Tigger Bounces! OH and I'm incredibly jealous! The ride, the show, the report (and the opportunity to read the report) are all awesome. And that you inspired a man who has inspired so many others - also awesome!!. Location: just so. . .
Now THAT'S a ride tale. Impressively done with a impressive subject!! Geez, Rick! You impress me more every time I read/see your stuff! Holy carp! Yes, you do need to write this up for the BTS. Definitely.